Manchester Thunder, Loughborough Lightning and Team Bath have all sealed their place at the 2019 British Fast5 Netball All-Stars Championship to join defending champions Wasps Netball at the Copper Box Arena, London on Saturday, October 12. Four more teams will join the quartet in the £100,000 tournament, which returns for its third year in the autumn and will feature the top eight teams from the 2019 Vitality Netball Superleague. Superleague leaders Thunder defeated Strathclyde Sirens on Monday evening to ensure they cannot be edged out of the top eight this season. That win also meant qualification for Team Bath, while Loughborough Lightning beat Saracens Mavericks to guarantee a top-eight finish. Mavericks themselves are just one win away from qualifying and will be confirmed for the Fast5 All-Stars should the beat London Pulse on Saturday. Featuring 12-minute matches, an all-star 5-point line and a Golden Buzzer Power Play, the British Fast5 Netball All-Stars Championship is an all-action afternoon of non-stop, pulsating netball. Don’t miss out and get your tickets for the 2019 British Fast5 All-Stars Championship now! 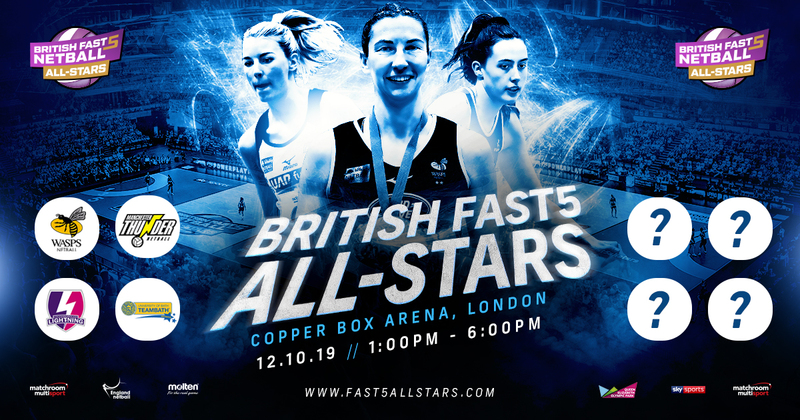 The 2019 British Fast5 All-Stars Championship will take place 1-6pm on Saturday, October 12 at Copper Box Arena, London. Strathclyde Sirens blazed their trail onto the Vitality Netball Superleague scene two years ago and are out to shake things up in 2019. They laid down a marker at Super 10 with an impressive 56-38 victory over Surrey Storm before suffering a 55-45 defeat to five-time champions Team Bath in Round 2. We caught up with Claire Maxwell and Cat Tuivaiti to talk female icons, their thoughts on the team’s strengths and the Vitality Netball World Cup. Who are your female icons and why? Claire: I love Serena Williams because I feel like she’s a strong female in the world. She’s very powerful, very dominant and she does it in her own way as well. She’s had some hard press in her life and she’s pushed through and she’s determined and she’s the best in the world at what she does. Cat: There’s a New Zealand shot putter called Valerie Adams, she’s very successful. I think I admire her a lot because I couldn’t possibly imagine being in a sport where you only had yourself. I think I spend a lot of time leaning on my teammates and management and everyone else. She’s been in a solo sport for so long and been so successful, she’s overcome some pretty big barriers and she’s been the best at her craft for around 10 years so I admire everything about her, she’s pretty incredible. What do you think your team’s main strengths are? Claire: We’ve got that grit and determination that’s never short of our game and I think it’s part of our trademark so you know whoever we’re against we’re going to fight for that ball for the full 60 and never give up and I’m really proud that that’s one of our key strengths as a team. What are your expectations for the team? Cat: I think I hold learning quite high on the list. I think there are some very young girls coming through and a number of Scottish players which is really good for Scottish netball at the moment with the Vitality Netball World Cup coming up as well. We just want to rock the boat, we want to shake up the competition a little bit – it’s going to happen. With the Vitality Netball World Cup fast approaching, what impact will this have on the league? Claire: The league is getting bigger and bigger in terms of the amount of people that are actually watching our sport and taking note of it, which is fantastic. There are so many people who come for the first time and then they love it which they don’t expect to do which I think is such a thing about our sport. Something we can be really proud of is that we take people by surprise with how athletic it is so the audience is growing and growing. I think that’s going to become even more evident at the Vitality Netball World Cup and with so many players bidding for a World Cup place – whether it’s in the England team, ourselves, etc. – you know it’s going to make it one of the best leagues in the world. Get your tickets for the Vitality Netball Superleague Big Easter Weekend! The Vitality Netball Superleague is delighted to introduce a fantastic new addition the Superleague calendar… the Big Easter Weekend! Over the weekend of the 20th and 21st April, four teams travel to Glasgow with the remaining six taking to the court in Coventry to continue their battle to finish in the top four. As the season intensifies, and with two games in two days, the make-up of the league could hinge on what happens over the Big Easter Weekend. With your favourite players taking to the court for a two-day festival of netball prepare to be mesmerised and inspired by the sensational skill and athleticism on display. Strathclyde Sirens will be hosting London Pulse, Loughborough Lightning and Manchester Thunder at the Emirates Arena in Glasgow. Day one sees the home side take to the court to face last year’s runners-up Loughborough Lightning followed by league newcomers London Pulse taking on 2014 champions Manchester Thunder. Day two in Glasgow starts with Sirens taking on London Pulse before Lightning face Thunder. Wasps get things started in Coventry as they face Surrey Storm and the day finishes with Saracens Mavericks on court against Celtic Dragons. The second day in Coventry gets underway with Wasps battling against Dragons before Severn Stars’ arrival is marked with a clash against Storm. The weekend finishes with an eagerly-anticipated clash between Team Bath and Saracens Mavericks. You can buy tickets for each day or make a saving and enjoy two days of top class netball with our two-day ticket option. Don’t miss your chance to watch the UK’s best sides take to the court and do battle as the 2019 season draws to a close. Director of Netball, Kat Ratnapala, will take benecosMavericks to Marshall Arena, Milton Keynes on Monday 15th April 2019, to take on new opposition for the club’s annual showcase event. The new season sees benecosMavericks meet 2018 Vitality Netball Superleague champions Wasps in a clash that is set to be an outstanding match. This game will also have the added interest of seeing the Corbin sisters playing together alongside their fellow Vitality Rose & ex Wasps shooter George Fisher. Make sure you grab your tickets early and join us at this new venue for netball and enjoy a top class Vitality Netball Superleague spectacle – buy your tickets here!